The Urban Incubator is a Goethe-Institut ‘project of excellence’, supported by the City of Belgrade and the Municipality of Savski Venac. The Urban Incubator: Belgrade involves more than ten local and international projects from the fields of art, architecture, urbanism and social engagement. The Urban Incubator is a unique cultural project aiming at a critical and participatory re-development of the neglected city quarter of Savamala –international artists, researchers and activists will support and enable residents and local institutions to revitalize their urban environment. When, in 2010, the Goethe-Institut Belgrade was looking for a temporary relocation, possibly a pavilion or a container village on a derelict space in Savamala, the project “Eurocode 8” was born: according to German earthquake safety regulations, a two to three year ́s evacuation of the Goethe-Institut at Knez Mihailova would offer a unique opportunity to focus the activities of a prestigious and very much appreciated cultural institution in the Belgrade downtown area of Savamala. of a city quarter” at the banks of River Sava very much neglected and cut-off – by railway tracks, congested traffic arteries or more mental borderlines – from public awareness as much as from much hope for potential improvement by investment, development or any other initiative any time soon. This opened the path to invite local and international projects to come to Belgrade and to be part of a long-term process which would introduce local and international initiatives and approaches how, together with residents and citizens of Belgrade and Savamala, to create a new awareness about the potential of Savamala, to discover the “pride of the place”, its stories and hidden history, and – at the same time – to develop new ideas and visions: about who will and how to shape Savamala, how to create the city of the future. The Urban Incubator is a Goethe-Institut ‘project of excellence’, supported by the City of Belgrade and the Municipality of Savski Venac. 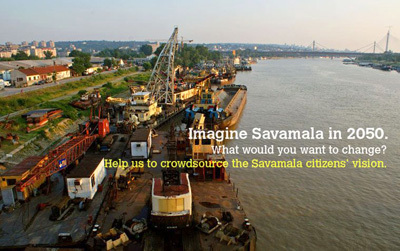 The Urban Incubator: Belgrade involves more than ten local and international projects from the fields of art, architecture, urbanism and social engagement, which will be present and operational in Savamala for during 2013. Project authors include raumlaborberlin, the University of Technical Sciences (ETH) Zurich, “Third Belgrade” Artists´ Initiative (Belgrade), the University of Fine Arts of Hamburg, the Zurich University of the Arts, Nexthamburg (Hamburg), GingerEnsemble (CH), Camenzind (Zurich), Maja Popović and Boba Stanić (Belgrade/Amsterdam), Goethe-Guerilla, and many others. Partners of URBAN INCUBATOR: BELGRADE Project: German Agency for Technical Cooperation GTZ, Federal Ministry of Transport, Construction and Urban development of Federal Republic of Germany, Embassy of Switzerland in Serbia and Pro Helvetia Foundation, the City of Belgrade, municipality of Savski Venac, cultural center “KC Grad”, Dom Omladine Belgrade, ETH Zurich, PERI.